What is a Lettering Challenge? Should you participate in one? WHAT IS A LETTERING CHALLENGE? and Why you should participate in one! You have seen lettering challenges online and might be wondering what they are. Or maybe you are wondering how to participate or if those challenges are even worthy? If you have any of those questions, then this post is for you. 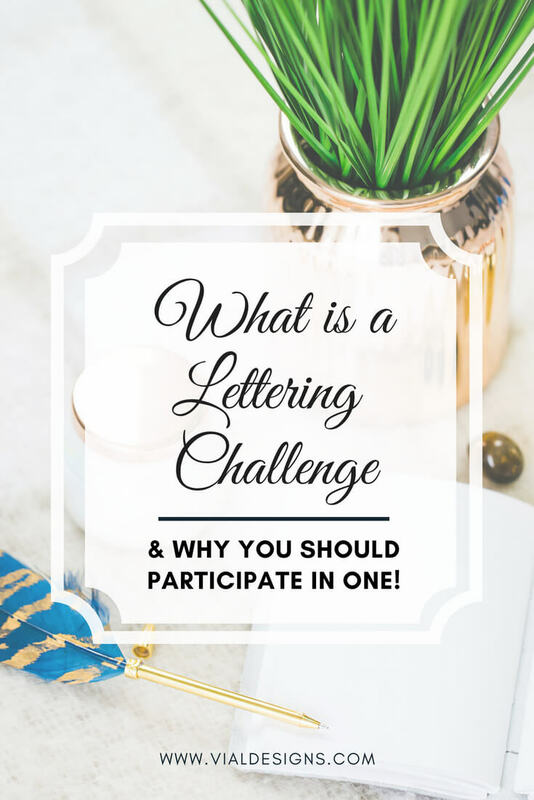 In here, I want to clarify what a lettering challenge is and why you should consider participating in one. What is a Lettering (Or Calligraphy) Challenge? A lettering challenge is a monthly list of prompts to encourage you to practice your lettering. 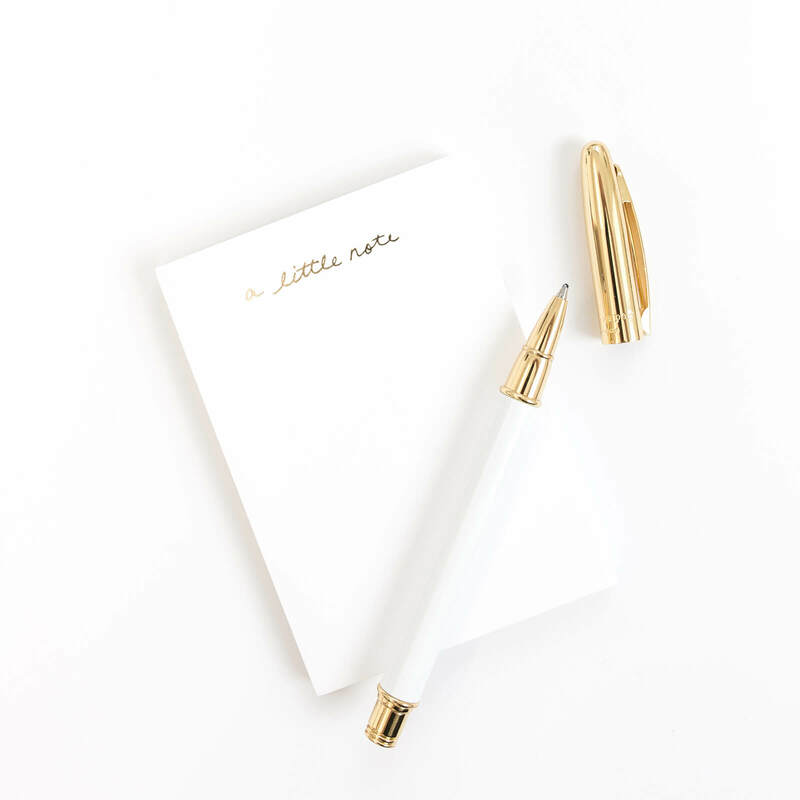 The goal is for you to letter the prompt of the day. You can take part in the whole month or a few times. Participation is up to you. Of course the more you participate and practice, the better. To hold yourself accountable, you are encouraged to share your work on Instagram. 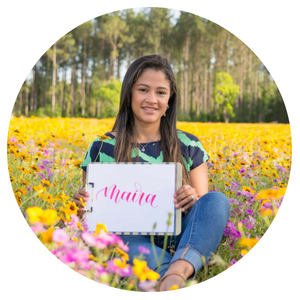 Why should you participate in a lettering challenge? If you ever wanted to improve your lettering, then practice is the way to do it. One of the biggest questions, when you are trying to practice, is what to letter. I can’t tell you how many times I’ve starred at a blank piece of paper for too long and nothing comes to mind. Having a prompt ready makes it much easier to start practicing. Knowing what to write takes the guessing game off you practicing time. When I started calligraphy, doing lettering challenges helped me a lot to stay motivated and to keep up with my practice. Even now, I try to do them as much as I can. Want a fun and inspirational way to improve your calligraphy and hand lettering? If your answer is yes, then I’m glad you are still here. I teamed up with my #calligrabestice Candice from @dashingletters to bring you the #InspiredCalligraphy challenge. Each month we gather inspirational quotes and put them together for the challenge. We hope to help you practice while keeping you motivated in this calligraphy journey. 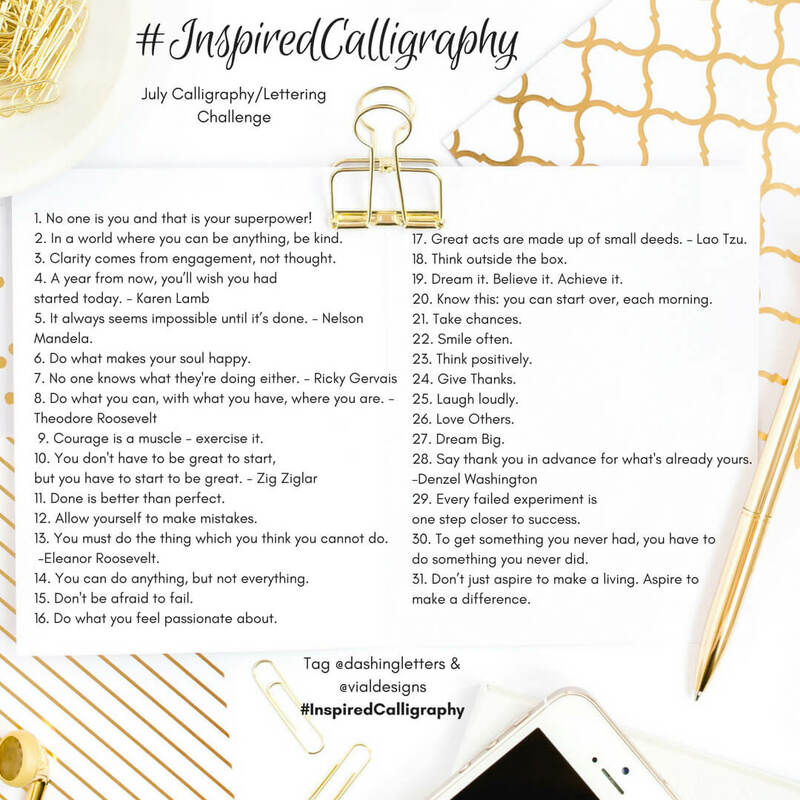 Here are the July Prompts of our #InspiredCalligraphy Challenge. You can save this image over on my Instagram account @vialdesigns so you can reference it there. To make it more convenient, you can also download the FREE PDF from my resource library. Just fill out the form below to gain access to it. The truth is our brains are wired for negativity. So it is easier for us to be discouraged than to keep a positive mindset. That’s why I love inspirational quotes! Those simple, yet powerful reminders that help us move forward with our challenges. Get the monthly list of prompts. We’ll be posting the monthly prompts at the beginning of the month. We’ll post them on Instagram, and I will also be sharing them here on the blog along with a FREE printable PDF. Feel free to repost the monthly prompt image to let others know you’ll be joining. Letter the quote of the day. We encourage you to set aside at least 30 mins every day to practice your lettering. Every day there will be a prompt so you can choose to create a lettering piece using the whole quote. Or you can also get creative, pick a word that stands out and use it to practice. The challenge is called inspired calligraphy, but you are welcome to use any lettering style or form of art you want. Share your work. Every time you participate, make sure you share your work on Instagram. Use the hashtag #InspiredCalligraphy and tag us @vialdesigns and @dashingletters so we can see your work. Take it a step further and reflect on the quote. When we are putting together the quotes for the challenge, we make sure they are meaningful. When I’m creating a design on a quote from the challenge, I try to reflect on what the quote means to me. I also try to find the ways I can put it in place in my life. Once you’re done with your creation, even if you don’t share it on Instagram, make sure you display it. Having that constant reminder close to you will give you an added boost of positivity. Another great way to reflect on the quote of the day is to journal about it. This lettering challenge is NOT about perfection! This challenge is about practicing and having fun while doing it. Need some ideas to get started with lettering the quotes? Search through Instagram or Pinterest to get some inspiration. Better yet look outside or around you. Make sure to use what you see for motivation, and not to copy someone else’s work. Incorporate your style! This challenge is to help you create your own. To share your uniqueness (is that even a word?) with the world. If you’d like to get started with learning calligraphy, I think you will love this blog post. Even if you don’t share your work on social media make sure you keep it and date it. That way you can come back to it later and see how much you’ve improved! I promise if you keep practicing, you will see the improvement in your work. I’d love to see your work on Instagram, so don’t forget to tag me in your posts. Be sure to check the hashtag #InspiredCalligraphy so you can see other people’s work. Leave them encouraging comments to spread the love and extend the motivation! If you have an inspirational quote you would like to be added to the challenge, let me know in the comments below. Happy practicing! Have a fantastic day! 2 Comments on WHAT IS A LETTERING CHALLENGE? and Why you should participate in one! Easter Blessings with a cross as the t in Easter. Thank you for the suggestion, Jennifer!